RALPH WILSON/Sun-Gazette Correspondent Bucknell’s women’s basketball players celebrate their victory over American that earned them the 2019 Patriot League championship on Sunday in Lewisburg. 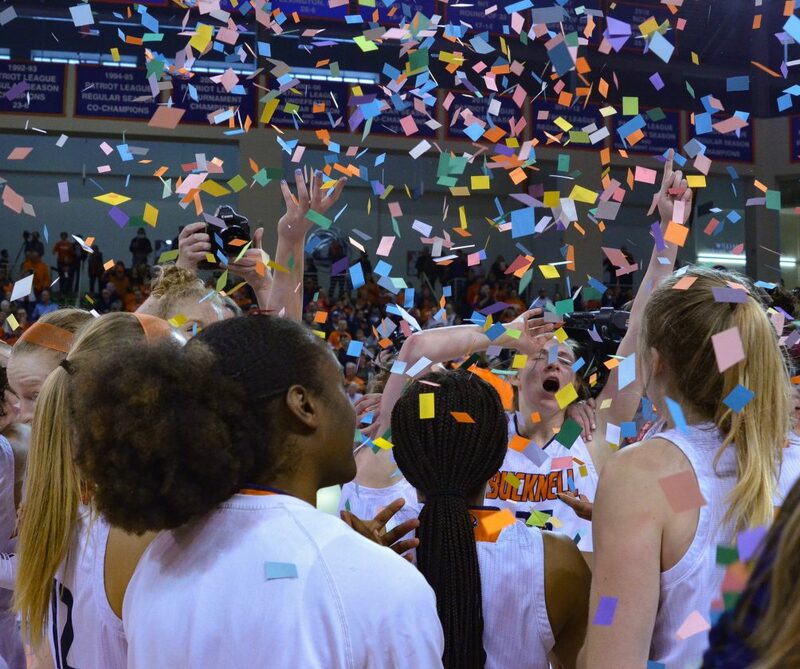 The Bison earned a berth with the win to the NCAA women’s tournament. LEWISBURG –Bucknell may have found its seed and opponent a few hours earlier than it was supposed to, but it didn’t make the moment any less special. Bucknell earned an automatic berth to the NCAA Tournament with a 66-54 Patriot League Championship win over American on Sunday. Thanks to an ESPN gaffe, the women’s bracket was released a few hours earlier before its 7 p.m. selection show last night. The Bison didn’t find out who and where they were playing like they would’ve imagined, sitting with teammates and friends huddled together in front of a projector. They didn’t get to feel that genuine elation when “Bucknell” popped up on the screen. Instead, that happiness was felt in their apartments, dorms and classrooms when a team group text made its way around. Either way, Bucknell has a chance to add to an already historic season as the program will search for its first NCAA Tournament win when 12th-seeded Bucknell takes on fifth-seeded Florida State, which earned an ACC at-large bid, Friday at 4 p.m. at Charlotte, North Carolina’s Halton Arena. Bucknell (28-5) already set a program-record with its win in the Patriot League championship game and set another record with its 12th seed being the highest in Patriot League history. The Bison earned their second Patriot League title in three years a couple days ago after winning the regular season title with a 16-2 mark in Patriot League play. This will be the program’s fourth trip fourth trip to the NCAA Tournament and second in last three years. Bucknell can claim the title of best Patriot League team of all time if it can win the league’s first NCAA Tournament game and with a win, it will tie the league record with 29 wins. The Bison want to get that bad taste out of their mouth after a 103-61 loss to third-seeded Maryland in the 2017 tournament. This Bison team is more experienced and senior-laden and has a better draw against Florida St.